These are the three men in my life. 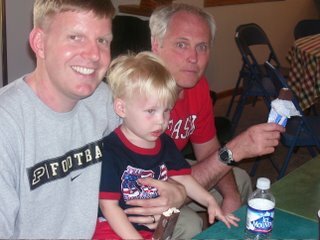 My husband Eric, son Jonathan, and my Daddy (I may be 32, but I will always be his little girl). God has used them to teach me facets of His character. From my Daddy, I learned that God truly is my Abba Father that I can run to like a little child and receive warm hugs and tons of affection. Through my husband, God has revealed glimpses of His deep love for me. A kind of love that loves me with my faults, but challenges me to be more tomorrow than I am today. A love that supports my dreams and grounds me reality. And by being a parent I have been overwhelmed with how rich and deep and wide my Father's love must be. From the moment I held Jonathan, I was amazed with the love I felt for him. Why was it a surprise? Don't all parents feel that way? Well, my legal work has taught me that no some parents don't, and Jonathan is my second child. I expected that flood of love with Abigail. With Jonathan I realized that love can multiply. It isn't a zero sum game, but an ever expanding commodity. How has God used the people in your lives to reveal His love for you? This is your Scenes & Beans buddy from just north of Kanner Lake! You didn't mention in your email and I don't see it on your blog (although I may have missed it), what do you like to write? Are you published and what do the initials of the group you belong to stand for? I've been considering starting a blog or website for Brandilyn's Scenes & Beans. Was it hard and how did you get started, or did you do it yourself? God has used my mom and dad as examples of unconditional love, longsuffering patience, and complete joy... and they're visiting us now in Colorado! When I look at my son and get that lump in my throat...I can't even fathom God's love for me. I think if I love my child this much and God gave his own son for me...it's too much to take in. It's one of those things becoming a parent kind of puts into perspective.